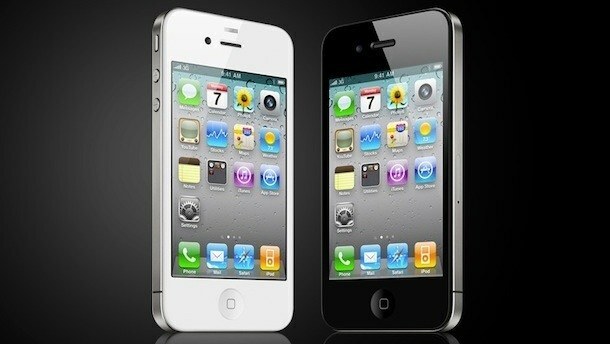 This price data is directly from AT&T and applies to both the White iPhone 4 and the Black iPhone 4. Interestingly enough, you can actually still buy the iPhone 3GS without a contract too, but it comes at a cost of $499 which makes the iPhone 4 seem like a much better deal for $100 more considering all the additional new features. Here is the cost chart from AT&T, you can see the price of iPhone 4 without contract in the highlighted “NO COMMITMENT” column on the right hand side. The reason the iPhone 4 is so expensive without the two year contract commitment is that it isn’t subsidized by the carrier (in this case, AT&T), so you have to pay the full premium price to get the phone. The iPhone 4 price goes down dramatically when you do sign onto the two year commitment, at $199 and $299 for the 16GB and 32GB models respectively. The “no commitment/no contract” price does not mean the iPhone 4 comes unlocked, that just means it is without the two year service agreement from AT&T. This only applies to iPhones sold in the USA though, and many other countries will offer contract-free and unlocked iPhones for sale. Paying 599$ for a AT&T locked iPhone 4 ?! Do you have to pay an extra fee to unlock it or is it impossible in U.S. to have it unlocked without jailbreak/hack it ? You are still tied to AT&T in the USA if you buy the phone without commitment. I just went through the process for a friend of mine outside of the USA, he plans on unlocking it. It was faster (and cheaper) for him to buy a US iPhone and then unlock it then to wait however many months until the device is available locally. Of course the carrier unlock isn’t released yet, but should be soon! Can we buy the untied iPhone4 in Cambodia? Thanks. That was what I was looking for. Have you gotten any more information regarding this? Is there any difference between unlock and jailbreak/hack? I would much much appreciated of your answer. That’s pretty damn cheap. In germany they want to you pay ~1000 EUR (~$1250 that is). pls., help and send to me the information on how to buy an iphone and also the commitment and non commitment plan. is it possible to get an iphone 4 16 gb without a contract……no doubt at a price higher than USD 199.
when you buy the iPhone 4 (without contract) do u have to buy minutes from the store or you don’t have to use minutes?? i will like to buy an i phone 4 16 from the usa, that is unlocked and ready to use with any service provider in nigeria. i do like to know the cost in the usa. Can someone tell me why people want to buy an iPhone 4 without contract? What are the considerable pros and cons? And what is this contract all about? 9000/- rs in Indian currency..Is that so cheap as per Indian rupees?? Or my friend will have to pay custom duty?? I am rookie in this stuff, but want iPhone..
but in iphone4 is available with AT-T’s contract at $199 so can we get……?? The contract costs something like $375 to break. If your friend buys the phone for $200, it will be under a 2 year contract and it will cost you $200, plus an extra $375 to break the contract. The reason is because the phone company buys the phones from Apple for around $600 and gives you a discount on the cost, because they expect to make that money back over monthly fees. I was going through this page and just wanted to confirm, if i purchase an iphone with AT & T contract for USD 199 (16 GB) from US and take it back with me along to India and get it unlocked here..
How would i need to pay the remaining USD 375 (fee for breaking the contract)? I mean if i get it purchased from US and bring it somewhere out from US and get it unlocked.. what would be the pro’s and Con’s for it to get it unlocked other than that the warranty would void!!! I was going through this page and just wanted to confirm, if i purchase an iphone with AT & T contract for USD 199 (16 GB) from US and take it back with me along to India and get it unlocked there..
BORA….im in cambodia…but where do u unlock an iphone 4 ? sovanna or soriya or iones or somewhere else? Can i use a brazilian chip on Iphone4 ? i dont understand the no contract thing. if u buy an iphone from the store without contract does this mean that i leave the store without any calling service?? or would i still have at&t?? if i still have at&t would i have to pay the cancellation fee?? please reply. im kinda confused with all this. when u buy a iphone from the store w/o contract means the iphone has NO SERVICE (no min, no data, nothing). But in the same time that phone working only in the USA with the carrier u bought it from. w/o contract it cost you more, almost like you buy it from Apple directly. In order to get the iphone work in different country you have to unlocked, but I’m afraid you will loose some “capabilities” well said some features will no work. It a game if u want to try. Good luck!. if i buy an iphone from usa with contract..will i be able to get it unlocked and use here?after i buy the phn wid contract..will i have to be in touch wid the company i bot da phn from? I am technically not eligible until February, but my dad is, he will take my iPhone 4, can I have him order the phone and then swap them out? Would I have to go into an AT&T store? Would tehy even let me do this? i want to buy iphone4 in indonesia but i worry it can not use in cambodia some want can tell me please? hi i am going to buy an iphone4g which is in 2yrs contract wid at&t in usa so can i directly take it before contract to india n unlock it there? I want to know spouse if I buy i-phone4 from USA so can we unlock AT&T code?